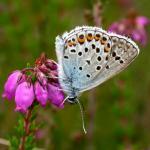 Special features: If you see a blue butterfly in your garden, it's most likely to be the Holly Blue. It's the only blue butterfly which is regularly seen in gardens. You can distinguish a Holly Blue from the other blue butterflies by the very bright silver-blue undersides of the wings. 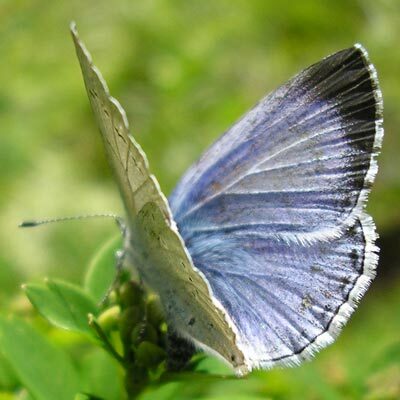 The only other blue butterfly with similar markings is the 'Small blue', but this is a much smaller butterfly. The Holly Blue nearly always rests with its wings tightly closed. 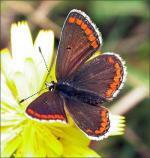 It only rarely opens them slightly to reveal the vivid blue forewings, which have a white border. The females (above) also have a black band near the edge. This species has two broods each year, and the second brood usually has a thicker, more prominent black band. The Holly Blue caterpillar releases a sugary secretion which attracts ants. In return for this sweet snack the ants help to protect the caterpillar through pupation. Distribution: Found throughout most parts of England, Wales and N. Ireland. Scarce in Scotland. Months seen: March to September. Food: Nectar and honeydew. The bright green caterpillars feed mostly on holly and ivy.